WARSAW – Warsaw girls track coach Scott Erba spent plenty of time at the Northern Lakes Conference Meet Tuesday night passing out high-fives to his team. The talented Tigers, led by record-setting sensation Ashley Erba, gave him plenty to celebrate by night’s end. The No. 14 hosts won the postseason event for the seventh straight year, piling up 180 points to easily outdistance runner-up Goshen (107) and third-place Northridge (104). The 180 points falls just short of the meet record of 190 scored by Warsaw in 2011. The 73-point margin of victory is a meet record. The seven straight NLC meet championships, highlighted by two event records by Erba, breaks the mark of six in a row set by Warsaw from 1983-89. Erba, as in the coach, gave a big hug to his daughter after the star junior capped her night by breaking the meet standard to win the 3,200. “It was great to see the girls excited tonight and they showed they were ready to compete,” said coach Erba. “The historical part of winning seven straight is also exciting. It means consistency to me. These girls were in elementary school when that started. Our program continues to produce quality girls year after year. Ashley Erba was the story on this night for the undefeated Tigers. The junior long distance standout, who won the state cross country title last fall, won the 1,600 in 5:01.89. That broke the old meet record of 5:06.29 set by Rachel Stichter of Wawasee in 2004. She capped her night with a clocking 10:47.18 in the 3,200 to top the previous mark of 10:59.78 set by Megan Jackson of Northridge in 2005. “The records were definitely what I was going for tonight,” said Erba, who also set a new school mark in the 1,600, breaking the old standard of 5:03.15 set by Kelly Louglin in 1992. “It feels great to knock out both of those. There’s been some great girls come through the NLC. I’m totally pleased tonight. I’ve really come to enjoy and embrace the 3,200. I like the longer distances and it lets me completely control how I perform. Tonight, I had my eye on my splits. I knew I had the record. Ann Harvuot also had quite the night for the Tigers. The sensational sophomore sprinter won the 100 (12.56) for the second straight year and the 200 (26.28) and ran the anchor leg on the champion 400 relay team, combining with Regina Anderson, Mariah Harter and Brittney Rhodes to win in 50.85. The champion Tigers also captured first in the 1,600 relay as sophomore Jackie Ferguson and freshmen Nicole Eckert, Megan Kratzsch and Tennie Worrell won in 4:03.89. Junior Megan Dearlove won the pole vault by clearing 10-3. Both winning Warsaw relay teams posted season best times and Dearlove had a personal best by nine inches to claim her championship. Wawasee got a championship performance by Jordan Edington. The junior won the shot put with a throw of 37-2. 1/2. Wawasee, which finished in eighth place with 47 points, also had a third place finish in the pole vault by senior Sarah Rozow. Warsaw 180, Goshen 107, Northridge 104, Elkhart Memorial 96.5, Concord 75.5, Plymouth 65, NorthWood 56, Wawasee 47. 1. Plymouth (Meagan Fisher, Libby Read, Maggie Morrow, Allie Wright), 9:37.68; 2. Warsaw 9:43.15; 3. Northridge 9:54.50; 4. Wawasee 10:10.84; 5. Memorial 10:17.30; 6. Goshen 10:20.98. 1. Liana Yoder (G) 15.37; 2. Jessica O’Connell (C) 15.89; 3. Jackie Ferguson (War) 15.97; 4. Brittney Rhodes (War) 17.16; 5. Cianna Bonfiglio (C) 17.22; 6. Stephanie Bettis (EM) 17.32. 1. Ann Harvuot (War) 12.56; 2. Lauren Stutzman (G) 13.09; 3. Angelica Ramon (NW) 13.16; 4. Regina Anderson (War) 13.25; 5. Melissa DuBois (C) 13.28; 6. Lauren Lambert (NR) 13.31. 1. 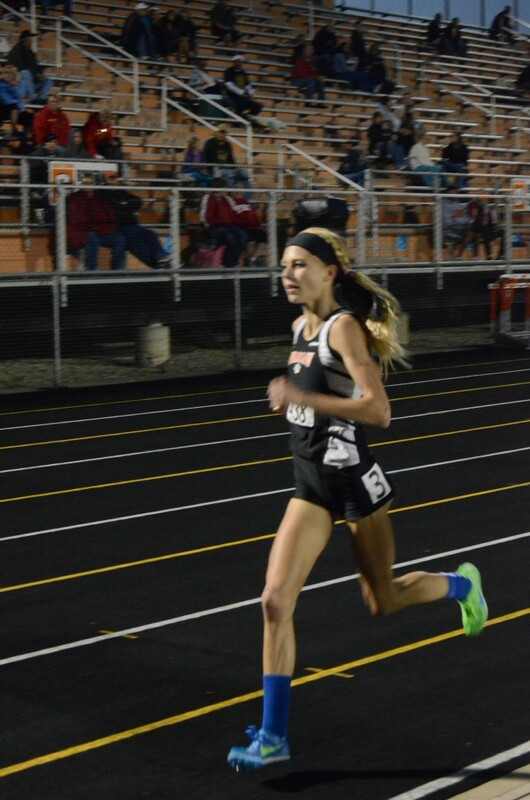 Ashley Erba (War) 5:01.89, new meet record, replacing 5:06.29 set by Rachel Stichter of Wawasee in 2004; 2. Corinne Cominator (NR) 5:11.6; 3. Sierra Moore (EM) 5:17.28; 4. Jennifer Schrock (NR) 5:26.09; 5. Adrienne Henke (G) 5:37.04; 6. Abby Patrick (P) 5:40.43. 1. Warsaw (Regina Anderson, Mariah Harter, Brittney Rhodes, Ann Harvuot) 50.85; 2. Concord 50.94; 3. Memorial 51.56; 4. NorthWood 52.92; 5. Northridge 54.35; 6. Goshen 55.09. 1. Allie Wright (P) 59.60; 2. Tennie Worrell (War) 1:00.52; 3. Allison Hoefle (EM) 1:00.61; 4. Megan Kratzsch (War) 1:02.01; 5. Edith Gonzalez (G) 1:04.28; 6. Olivia Golden (NR) 1:04.64. 1. Liana Yoder (G) 45.40, new meet record, replacing 45.69 set by D. Duerloo of Plymouth in 1994; 2. Jessica O’Connell (C) 45.55; 3. Jackie Ferguson (War) 47.78; 4.Kayla Bixler (War) 48.96; 5. Bekah Ross (NR) 50.83; 6. Lindsay Ziegler (NW) 50.89. 1. Sierra Moore (EM) 2:18.02; 2. Corinne Cominator (NR) 2:18.34; 3. Brooke Kline (War) 2:20.78; 4. Meagan Fisher (P) 2:20.82; 5. Breanna Robinson (Waw) 2:22.26; 6. Mackenzie Gray (NR) 2:26.97. 1. Ann Harvuot (War) 26.28; 2. Liana Yoder (G) 26.29; 3. Angelica Ramon (NW) 26.90; 4. Lauren Stutzman (G) 27.24; 5. Christiana Juroff (NR) 27.32; 6. Mariah Harter (War) 27.49. 1. Ashley Erba (War) 10:47.18, new meet record, replacing 10:59.78 set by Megan Jackson of Northridge in 2005; 2. Jennifer Schrock (NR) 11:43.79; 3. Madie Royce (NR) 11:57.52; 4. Courtney Linnemeier (Waw) 12:13.31; 5. Shelby Harrell (P) 12:14.80; 6. Abby Patrick (P) 12:17.71. 1. Warsaw (Nicole Eckert, Jackie Ferguson, Megan Kratzsch, Tennie Worrell) 4:03.89; 2. Plymouth 4:07.64; 3. Concord 4:07.82; 4. Northridge 4:10.21; 5. Memorial 4:16.27; 6. Goshen 4:16.95. 1. Lily Russo (NR) 5-2; 2. Michelle Detwiler (C) 5-2; 3. Jamie Lacheta (War) 4-10; 3. Kaydon Fosler (P) 4-10; 5. Meagan Fisher (P) 4-10; 6. Mitzi Supper (C) 4-10; 6. Abby Schue (War) 4-10. 1. Melissa DuBois (C) 17-3, new meet record, replacing 17-2 set by Andrea Jackson of Elkhart Memorial in 2006; 2. Lauren Stutzman (G) 17-1; 3. Liana Yoder (G) 16-0 1/4; 4. Stephanie Bettis (EM) 15-9 1/2; 5. Courtney Farling (War) 15-1 3/4; 6. Jamie Lacheta (War) 15-0 1/2. 1. Mallory Conrad (EM) 122-8; 2. Karla Corral (G) 119-10; 3. Samantha Jensen (War) 116-11; 4. Lauren Burish (War) 115-0; 5. Cara Albert (EM) 105-2; 6. Brianna Tuttle (NW) 950. 1. Jordan Edington (Waw) 37-2 1/2; 2. Sarah Heagy (War) 37-1 3/4; 3. Karla Corral (G) 37 1/2; 4. Madison Stewart (NR) 36-5 1/2; 5. Deanna Cornelius (EM) 34-9 1/2; 6. Breann Johnson (Waw) 34-1 1/2. 1. Megan Dearlove (War) 10-3; 2. Melissa Berger (NW) 9-6; 3. Sarah Rozow (Waw) 9-0; 4. Jessica Tuttle (NW) 8-6; 5. Chelsea Bettis (EM) 8-6; 6. Brianna Ruiz (NR) 8-0.